On October 4, 1957, the Soviet Union forever changed the course of human history, launching Sputnik 1 into orbit around the Earth. Sputnik 1 was the first such artificial satellite, and being a creation of the USSR, a disappointment for Americans. The U.S. rushed out an attempt to get a satellite in space, launching Vanguard TV3 on December 6 of the same year. But just a couple of seconds after launch, and having ascended only four feet off the ground, Vanguard TV3 crashed, further dampening American hopes of dominating the heavens. Despite these setbacks, the U.S. government was not about to accept defeat. Just over a decade later, Neil Armstrong and Buzz Aldrin would become the first men — American or Soviet — to land on the moon. The successful moon landing boosted American interest and faith in the space program for decades. But that took years, and before it happened, few ideas were off the table. The U.S. wanted to boost the morale of its citizens, and space seemed like a great way to do that. 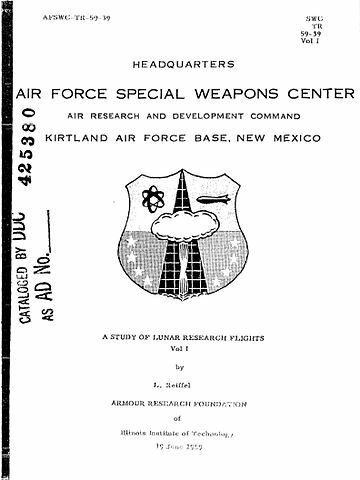 In 1958, the year after Sputnik 1 launched (and a few months after the U.S. got a satellite into orbit, in Explorer 1), the United States Air Force began the development of something called “A Study of Lunar Research Flights” or “Project A119.” The title was misleading. The goal of Project A119 was, simply put, to nuke the moon. Other than the show of galactic superiority, Project A119 had limited purpose. The display of awesomeness — in the literal sense of the word — was the goal. The team behind the project (which included a doctoral student named Carl Sagan) was specifically charged with determining three things: the potential effects on the moon’s surface (including whether nuclear fallout there would prevent future exploration), any benefits to scientific inquiry, and, most importantly, how to maximize the mushroom cloud of dust to ensure peak visibility of the explosion back here on Earth. Thankfully, the project was canceled well before anything nuclear exploded. Besides the fact that the idea was ludicrous, there were practical problems as well — for example, if the rocket failed, there was a chance that the bomb would have gone off on Earth. Regardless, a pair of treaties with the Soviet Union rendered any further nuke-the-moon investigation moot. The U.S. shifted its focus toward landing people on the moon, and of course, made history with the Apollo moon landings a decade later. Bonus fact: We never ended up bombing the moon, but, in the name of the Space Race, we did once bomb Arizona. As the Atlantic reported, to prepare for the moon landings, NASA wanted a testing ground which matched the topology of where the astronauts were, hopefully, about to go. So they took a swath of land in northern Arizona and bombed fake craters into the surface, and use that area to test rovers and tools, and to help the astronauts become familiar with the area. From the Archives: Thermonuclear War and Taxes: In case of the former, you’ll still have to pay the latter.